The latest and greatest evolution in blue-winged medicine is here. Cont (VC): If your Heart Card has “Celestial” in its card name, this Unit gains “Act (VC) 1/Turn: [Choose 1 of your Rear-guards with “Celestial” in its card name, Place it face-up in the Damage Zone] Choose 1 of your cards in the Damage Zone, Call it to (RC). Choose up to three of your Units, and for each face up card with the same card name as each of those Units in your damage zone, all of your Units with “Celestial” in its card name get [Power]+3000 until end of turn.”. “Holy Celestial, Anphael” is a “Celestial” G Unit. By placing 1 of your Rear-guard “Celestial” in the Damage Zone fac-eup, you can Call a Unit from the Damage Zone. This makes it quite useful to use with Units that activate their effects when a Rear-guard appears from the Damage Zone. And then you can choose 3 Units and then for each face-up card in the Damage Zone with the same name, for each, your “Celestial” Units gain 3000 Power! Meaning your Units can gain a total of 15000 Power! So send cards with the same name to the Damage Zone and aim to activate this effect! And there’s one more, “Absorb Celestial, Baharia”, who has an incredible ability that supports Stride from the Damage Zone. During the start of your Ride Phase, you can Soul Blast 1 “Celestial” card in your Soul, and place this card in your Damage Zone into the Drop Zone, and, and place the top card of your Deck into Damage Zone,during that turn, every card in your hand for the Cost of Stride is treated as Grade+2! All Grade 1 or higher cards in your hand can be used completely for the cost of Stride! And since itself is a “Celestial” card, you should include it in “Celeestial” Decks. 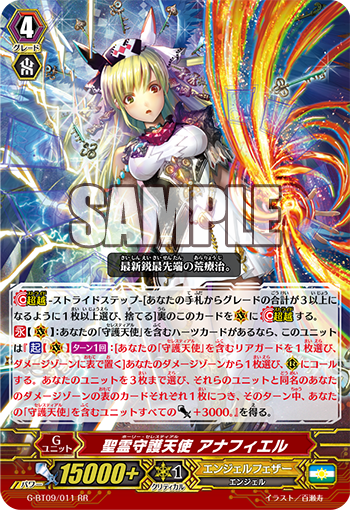 The 9th Booster “Divine Dragon Caper” contains many cards that strengthen “Celestial” Decks. Seize victory with the newly enhanced power of “Celestials”!